The University of Minnesota breeds fruit to survive harsh winters, and the apples in the breeding program used to be subjected to much colder winters decades ago. When older varieties like Haralson and Connell Red were developed, -20 degree temperatures were more common in Minnesota. 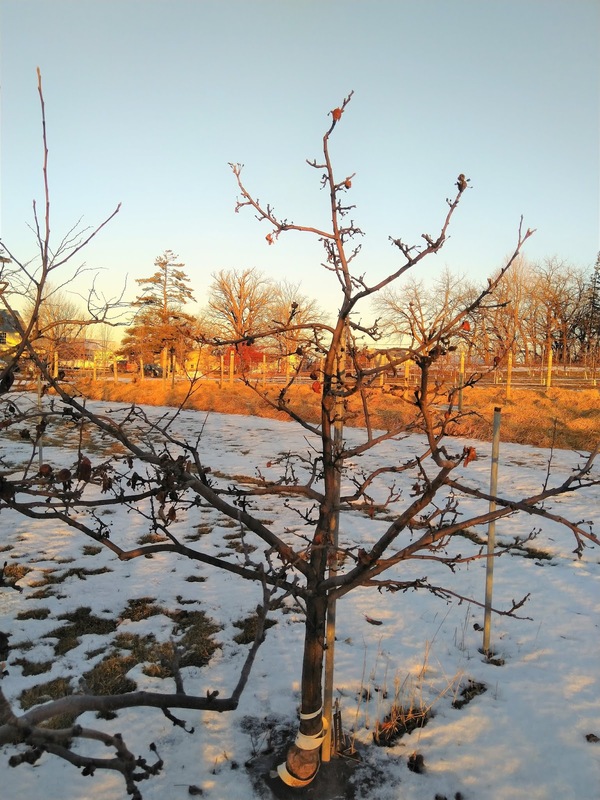 Still, Jim Luby, professor of fruit breeding at the U of MN, cautions that last week was the type of cold snap that can cause damage to apples and other fruit trees. The "cold hardiness" of a fruit variety refers to the ability of the plants to survive at cold temperatures. The relative cold hardiness of common Minnesota apple varieties is listed here. According to Jim, those rated as "very good" or "excellent" cold hardiness (e.g. Frostbite, Sweet Sixteen) on that webpage should not show much damage in the southern third of the state and may suffer some damage in the more northern areas. Varieties listed as "good" or "fair" cold hardiness (e.g. Regent, SnowSweet) will likely suffer damage in the southern part of the state and could be killed in the north. Here is a helpful resource for understanding what fruit varieties can grow best in your area: Fruits for Minnesota. The ability of a fruit tree to survive also has to do with the age of the tree and how healthy it is. Young trees (<5 yr) are usually more tender than older trees. Additionally, trees that were stressed during 2018 by overcropping (too many fruits produced on the tree), late season drought, or poor nutrition are more susceptible to winter injury because they were already starved for energy going into the winter. 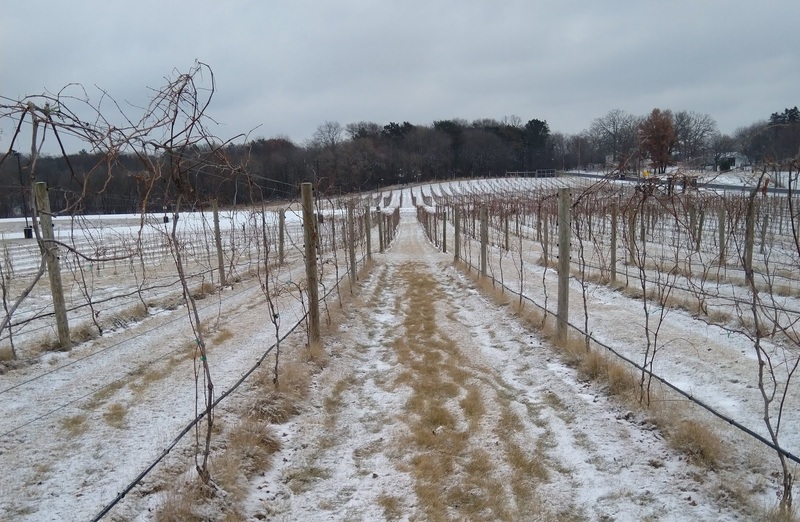 The hybrid grape varieties we grow in the upper Midwest are also bred to withstand harsh winters, surviving temperatures between -20 to -30 degrees. Even so, the polar vortex most likely did injure our Minnesota grapevines, killing some of the buds that would become fruit this year and possibly killing some of the woody tissue (trunks and branches) as well. The good news is that the few inches of snow on the ground will help protect the trunks and roots, allowing them to re-grow from the ground if the trunk itself is injured or killed. While these varieties are believed to be hardy enough to survive last week's vortex, new varieties like Frontenac, Itasca, LaCrescent and Marquette were released after 1996, so they have had very little actual exposure to those temperatures. Therefore, it is not possible to definitively say how much injury the the vines will sustain. Marquette: Marquette has been observed to survive at temperatures between -20° F to -30° F. In at least one case, it has withstood temperatures as low as -36° F without serious injury. Frontenac: Frontenac was released to the public in 1996, which saw temperatures similar to this week's polar vortex. It is considered very hardy and can survive temperatures below -20° F.
Frontenac Gris: Very closely related to Frontenac. It has been observed surviving temperatures of at least -35° F.
LaCrescent: Considered "Very hardy," surviving temperatures between -20° to -35° F. The trunks have been reported to survive at -36° F with only minor bud loss. However, another 2014 U of MN study measured substantial (up to ~60%) bud loss of LaCrescent at temperatures around -20° F. Therefore, bud loss in the cold can vary significantly. Brianna: Very hardy, surviving temperatures below -20° F.
Swenson Red: Will survive temperatures below -15° F. While it is thought to be less hardy than others, there are reports that the vines have survived -25 to -30° F without protection in the upper Midwest. Itasca: This is a new variety from the University of Minnesota. The toughest test of Itasca's hardiness before today was the polar vortex of 2014, but it did not get as cold then as 2019. In 2014, its bud survival was about 63% in a UMN evaluation, which was substantially higher than La Crescent, Marquette, Brianna, the Frontenacs, and Edelweiss that year. Please note that if a variety is listed as "hardy to -25" that does not mean that it won't have bud injury or trunk injury at that temperature. It only means that the vine is likely to survive at those temperatures if it is a healthy vine. If the vine had too much crop the previous season, that can hurt its chances of survival because the vine entered the winter already starved of energy. 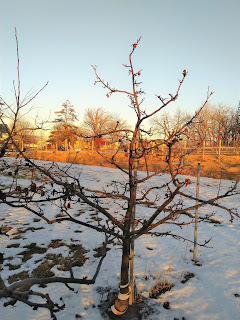 Apple trees that have sustained winter injury will have branches that either do not produce leaves at all, or may produce leaves in the spring before the leaves promptly wilt and die. Wait until next winter and then prune those dead branches off of the tree. It is unlikely that an apple tree would completely die after this winter. For grapevines, I recommend assuming that some buds are dead when you prune after a harsh winter. That means that when you prune off last year's shoots like normal, leave more buds on the vine than you typically would, to make up for dead buds. If you end up with too many live buds in the spring and the vine grows more shoots than you had hoped, you can pull some shoots off when they are very young. Here is some more information about pruning grapevines. Before you prune, you can evaluate how much bud damage your vine experienced. This is done by cutting into the tips of the buds with a blade, and looking at them with a magnifying glass or smartphone camera zoom to see how much green tissue there is in the bud. Green tissue is good. If the whole bud is brown inside, that bud has died. Watch this video to see how to measure bud injury. If you have 50% bud loss on the vine due to cold injury, you need to leave 50% more buds than normal when you prune this year. Additionally, if a cordon (the grapevine's semi-permanent branches) has died, start replacing that cordon with a young, healthy cane this season rather than leaving an unhealthy, less productive cordon on the vine. As Dr. Luby put it to me today, there isn't much standing between us from the North Pole this time of year. While Minnesota winters have become warmer in general, all it takes is one very cold blast from our northern neighbor to impact our trees. Meanwhile, the U of MN will continue to work hard to develop Minnesota Hardy fruit!